One of the talented players in the American National Football League (NFL) is Chris Hogan, the New England Patriots wide receiver. Although he joined the professional league as an undrafted free agent in the year 2011, his remarkable achievements and contributions speak volume for the father of twins. In 2017 and 2019, he was instrumental to the Patriots’ Super Bowl LI victory and has remained one of the team’s top players. This article will discuss his family, net worth and other necessary information about the NFL ace. Born 24th day of October 1988, as Christopher James Hogan in Wyckoff, New Jersey, US. He went to Ramapo High school where he played football and lacrosse to the admiration of his peers. Based on his superlative performances, he was named the first-team All-New Jersey performer as a junior and senior in lacrosse as well as an all-state first-teamer as a junior in football. After high school, he chose to attend Pennsylvania State University on scholarship and graduated in 2010 with one year of college sports eligibility remaining. While in Penn State, he started all 13 games as a freshman in 2007 and scored 11 goals. His sophomore season was not fantastic as a result of an ankle injury he sustained. The year 2009 was a better one for him as he recorded 29 goals on 133 shots which earned him first-team All-ECAC and a vote as the captain in his senior season. To conclude the one year of college sports eligibility after an ankle injury he sustained in 2008 while playing for Penn State, Chris Hogan enrolled at Monmouth University where he played for the Hawks. Within the one year he spent at Monmouth, he recorded 12 receptions for 147 yards and three touchdowns on the offense as well as 28 tackles and three interceptions on the defense. Hogan made his professional career entry as an undrafted free agent when San Francisco 49ers signed him on July 27, 2011. He spent just a few weeks with the 49ers and they released him on September 3, 2011. His services were immediately acquired by New York Giants on September 12, 2011, after being placed on the practice squad, he was released by the club the same month. He was signed by the Miami Dolphins on December 27, 2011, where he remained till September 2012 when his contract with the team was terminated. The Wyckoff-born footballer moved to Buffalo Bills on November 6, 2012, staying for 3 years before his contract ended in 2015 but he played 16 games and recorded 10 receptions for 83 yards in the 2013 season outing with the team. In his three seasons spent there, he played 48 regular season games, 87 receptions for 959 yards and 6 touchdowns. The wide receiver was re-signed by New England Patriots on March 10, 2016, as a restricted free agent on a 3-year contract of $12 million with $7.5 million guaranteed and in his first season with the Patriots, he played 15 games and recorded 38 receptions for a career-best 680 yards and 4 touchdowns. He was spectacular in the postseason where on February 5, 2017, he recorded 4 receptions for 57 yards as his team defeated Atlanta Falcons by 34-28 score in overtime to lift the Super Bowl LI. In his 2017 regular season, he played 9 games and recorded 34 receptions for 439 yards with a career-high of 5 touchdowns. The 2018 regular season saw him play 16 games with a record of 35 receptions for 352 yards and 3 touchdowns. His team reached the Super Bowl for the third time in three consecutive attempts in 2019 and defeated the Los Angeles Rams. Even though he recorded no catches, he was on the winning side as the Patriots ran out 13-3 winners to lift the Super Bowl LIII. Chris Hogan is still with the Patriots and has been giving his best for the team under the legendary coach, Bill Belichick. With the spectacular career Chris Hogan has been enjoying since he turned professional in the NFL, his salaries and net worth has grown alongside his game in the NFL as he is now considered as one of the best wide receivers in the league. His salary cap hit is said to be about $3.2 million although he has a running 3-year contract with the Patriots worth $12 million with assured $7.5 million. Apart from monies accrued to him from sports, he also enjoys income from endorsements deal one of such was his 2015 contract with Maximum Human Performance. All of which has brought his net worth to $6 million. Chris was born to Mary Ellen Hogan and James Hogan. He also has sisters and a brother, and during his wedding, his brother, Jeff Hogan, was his best man. 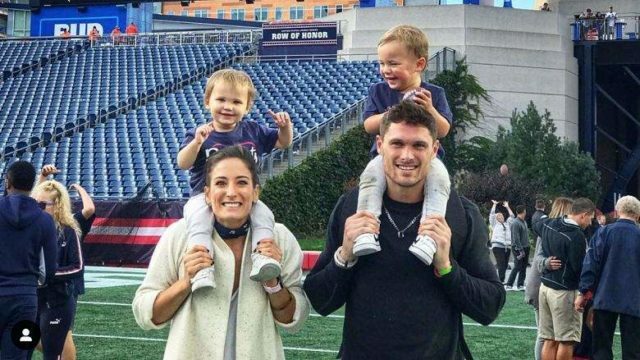 Chris Hogan has always acknowledged his family as being supportive. He is a family oriented man; he is a faithful husband that always finds out time to be around and play with his kids. Chris Hogan’s lovely wife is no other than Ashley Boccio, an American physician he met during his days at Pennsylvania State University. Both were very good at lacrosse games during their days at Penn State. Although the Patriots No. 15 man later transferred to Monmouth University and kept in touch with her until the friendship blossomed into engagement in July of 2014. They tied the nuptial knot, two years after their engagement, on July 1, 2017. The union produced a set of twins; Chase and Parker; born in March of 2017. Asley Boccio concluded her residency program at the Long Island Medical Centre, New York. The couple is living well ever since. The receiver has a towering height perfect for him as an athlete, he stands at a height of 6 feet 1 inch (1.85 m) with a complementary weight of 95 kg (210 lb).